Thus is farming | Dare Greatly! Ice Cream hasn’t been doing so hot. She got down a couple of days ago and hasn’t been able to get up. Something is not working right in her back-end. She doesn’t seem to hurt and is dragging herself about quite happily, but it is a painful thing to watch. Then the story gets better. She went into labor. (In the middle of the night.) The baby was too big and had one of his front legs behind him instead of under his chin, like he was supposed to do. (Think Super man position instead of Diver position!) I was able to pull him (fearing the whole time I was going to kill one of both of them). Fortunately, both were no worse for my assistance and were lucky that I noticed that she was fixing to have that baby because if I hadn’t stayed up all night to check on her, they both would have died. Ice Cream was completely worn out and still unable to stand. This did not stop her from talking to her baby and cleaning him off, when I put him close to her head. I milked Ice Cream by rolling her over onto her side and wound up using a rubber glove to get the colostrum into the single, big baby boy. Why a rubber glove? Because the bottle, I knew I had… I didn’t have or at least I haven’t been able to locate it. Regardless, we brought the baby in the house and fed him and got him good and dry and warm. Did I mention is was bitter cold outside? Next morning, Rowdy (he got named rather quickly) roused us with loud demands for breakfast. According to my Fitbit, I got 19 minutes of sleep. That’s what it felt like too. More milking Ice Cream as she lay on her side, more rubber glove feeding, and kudos to Ice Cream, she was very interested in her baby and cleaned him and checked him over before we moved him back inside for breakfast. At this point, he’s outside with his mother, who very generously rolls onto her side whenever he needs a snack. They have trained each other. Her to roll over and him to nurse with his chin on the ground. Interestingly enough, she makes a point of rolling over so that he can have the one that is full. So much for them being just dumb animals. Rowdy is happy, healthy, and living up to his name. He’s past being gentle and is an absolute pest about being under your feet if you’re in the pen with him. Ice Cream has regained some mobility in her back legs, but still remains unable to stand. She still drags herself around the pasture to eat and hasn’t lost any weight (we’re supplementing with grain, but would have anyway). 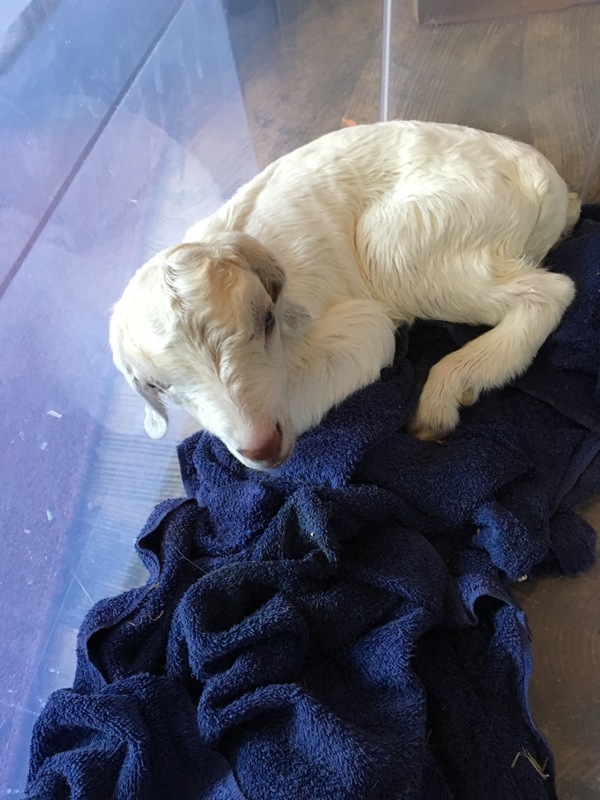 So here is what I’ve learned by my first goat delivery. Goats (like cows and horses) are going to pick the nastiest weather to birth their young. I need some kind of brooder light, heater, or something to help warm the babies (and me) when they are born. I need a cabinet that is for my animal supplies and nothing else; locking would be best, so that people can’t borrow them without me knowing. Maybe even a sign out sheet, so I know who has what when they do borrow something. After all, farming is a business and should be run like one… meaning inventory. And last, but far from least: farming ain’t for sissies.